The Honoring Americas Veterans and Caring for Camp Lejeune Families Act of 2012 has been signed into law, raising the VA home loan limits in San Diego. The Act includes a number of changes to the Department of Veterans Affairs Loan Guaranty program, including reverting back to the previous method of calculating maximum guaranty. This resulted in some loan limits increasing, including in San Diego County, whose VA loan limit increased to $ 518,750 from $ 477,000. That extra $ 40,000 could make a big difference for many veterans, said Russ Schreier, Vice President of Sales for Samuel Scott Financial Group. It could mean an extra bedroom, better neighborhood or outdoor pool. With rates at historic lows, a VA borrower could use that extra $ 40,000 and it would cost them less than $ 200 per month more in mortgage payments. 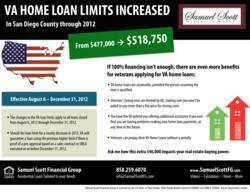 These changes in the VA loan limits apply to all loans closed August 6, 2012 through December 31, 2012. Loan limits for the 2013 calendar year will be posted once VA receives median price data from the Federal Housing Finance Agency (FHFA). Typically this information is received in November of each year. Should the loan limit for a county decrease in 2013, VA will guarantee a loan using the previous higher limit if there is proof of a pre-approval based on a sales contract or URLA executed on or before December 31, 2012. Even if you arent ready to make a purchase in 2012, veterans should strongly considered getting pre-approved for a loan now, said Schreier. The VA is going to guarantee the loan at the higher limit, so the borrower is protected if the loan limit drops in 2013. With a government-backed guarantee and no down payment requirements, VA loans are an incredible attractive home loan option. The program allows veterans with qualifying income and credit to purchase a primary residence without putting any money down towards the sale price of the home, as long as that sale price does not exceed the appraised value of the home. VA home loans are assumable, provided the person assuming the loan is qualified. Veterans closing costs are limited by VA, making sure you wont be asked to pay more than a fair price for closing costs. You have the VA behind you offering additional assistance if you ever find you are having problems making your home loan payments, at any time in the future. Veterans can prepay their VA Home Loans without a penalty. There are more than 25.5 million veterans and service personnel eligible for VA financing, with a large population located right here in San Diego. If you would like to find out if you are eligible for a VA loan, what your interest rates would be and what your mortgage payments would look like, contact one of our expert Mortgage Advisors. They have the experience and the resources to help you find a financial solution that will fit your unique needs and expectation.